As investment in the global offshore industry continues to grow, spending on maintenance and construction in the sector is correspondingly on the rise. As a contractor or subcontractor, to successfully capitalise on this market opportunity, you need to be able to demonstrate that you can meet key client objectives. These are likely to include lowering labour cost, reducing risk and improving worker safety, and increasing site productivity and overall efficiency. #1 We will work with you to engineer a bespoke solution, specific to your clients’ requirements. 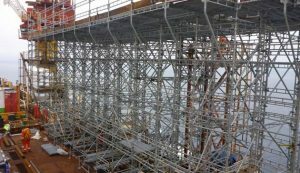 With years of experience working with some of the largest contractors in the field, HAKI has a record of developing bespoke scaffolding solutions for offshore operations. These solutions have seen numerous clients reduce project programmes and labour costs, whilst improving safety of workers on-site. #2 Our unique aluminium and steel ‘hook-on’ systems are made up of just 7 to 10 main components, allowing for quick and simple scaffold erection regardless of structure. The components can also be simply and safely used in HAKI stair towers, bridges and weather protection systems. As such, a HAKI investment can be used time and time again. #3 Your operatives can be expertly trained in HAKI systems and on-site technical support is available. HAKI’s technical team have 100+ years’ combined experience in the industry and are qualified to deliver a range of training courses at our in-house training facilities or on-site where you need them. This means you can ensure structures are erected, maintained and dismantled correctly and safely by your team. #4 You can make off-node connections with the HAKI load-bearing ledger beam. The ledger beam is at the heart of our system; allowing off-node connections to be made anywhere, using the beam rider, puncheon unit or any standard scaffold fitting – unlike most ring and lock systems. #5 You can create working platforms almost anywhere on the HAKI Universal system. This allows very close approaches to work surfaces or penetrating objects like piping, to be made using standard components. HAKI Universal can also simply be used as a step over to provide workers safe access across temporary pipe works. #6 You can protect workers by creating a ‘scaffolder safe zone’ with the HAKI Advanced Guard Rail (AGR). This safe zone can be maintained during erection, modification and dismantling, without the need for additional resource – in accordance with the UK’s NASC SG4 regulations. #7 Your structures can be built suspended and lifted/moved as necessary once erected, reducing time over-side and making it much simpler when suspending offshore. The HAKI ledger beam can be used as a suspension device, for safe assembly of a suspended bay, and a variety of other suspension devices make it possible to suspend from almost any load-bearing structure. The HAKI Advanced Guard Rail (AGR), used with a double-rider, also offers moving leading-edge protection when suspending scaffolds – adding an extra element of safety. Watch the video now. #8 The Universal system offers you the highest level of compatibility with traditional tube and fitting. HAKI standards are mainly manufactured using a 48mm tube, so standard scaffolding fittings can be easily attached. This is useful in some cases where a combination of traditional and system scaffolding is required. It’s also worth considering that HAKI Universal’s unique, cold formed spigots are manufactured without welding, providing secure connections for offshore suspended scaffolds, without need for costly tube and fittings. #9 You can create extremely stiff and stable platforms with HAKI Universal. HAKI steel decks match the traditional width of scaffold boards to maintain compatibility and the HAKI ledger beam allows for transverse decking. This eliminates the problematic treadling-effect of long boards. #10 State-of-the-art manufacturing processes mean your components are traceable back to their raw material. HAKI uses specially selected materials and assembles components in carefully monitored processes to ensure high-quality production at all times. Each product is stamped with our logotype and year of production to ensure no unsafe copies eat away at the safety margin. To discover more about the benefits of HAKI scaffolding for offshore projects, read our eBook here, or contact us now to speak to someone about our temporary work solutions in more detail.